The organization can’t operate without the right supplies being at the right place at the right time. If supplies are not available then care is impacted. The Health Management Academy (The Academy) announced the release of its most recent survey —an analysis of intra-company logistics at leading U.S. health systems. The quantitative survey polled Chief Operating Officers (COOs), Chief Financial Officers (CFOs), and Chief Strategy Officers (CSOs) at 21 leading health systems about their awareness, perspective, and strategy around intra-company logistics, which is the efficient and effective transportation of material goods (e.g., pharmaceuticals, lab specimens, equipment, supplies). Of responding executives, 75% reported that their organization has a defined strategy for intra-company logistics. More than three-quarters (76%) of responding executives reported their health system has been involved in activities that have increased the scale and/or complexity of the organization in the past 18 months. Of those systems that have grown in scale or complexity, most (69%) have seen an impact on the organization’s transportation operations. All executives who responded to the survey reported that achieving systemness – defined as delivering a similar patient-focused, seamless and high-quality care experience across the many parts of the system to maximize value for customers – is very important to their health system. Over two-thirds (67%) of respondents reported that implementing improved logistics and delivery was a part of that systemness strategy. Of health systems surveyed, most have commonly integrated/centralized redundant operations (70%), and/or deployed technology to better track the movement of items for complete chain of custody (45%) to improve logistics and transportation across the organization. 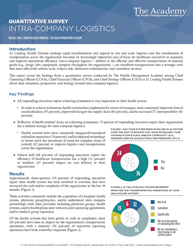 In April 2018,The Academy conducted a quantitative survey of leading health systems regarding their awareness, perspective, and strategy around intra-company logistics. Respondents represent health systems with an average Net Patient Revenue (NPR) of $3.0 billion that own or operate 142 hospitals with over 40,000 beds and approximately 1.9 million admissions annually. The Health Management Academy (The Academy) is a membership organization exclusively for executives from the country’s Top-100 Health Systems and innovative healthcare companies. The Academy’s learning model identifies top priorities of health system leaders; develops rich content based on those priorities; and addresses them by convening members to exchange ideas, best practices, and information. The Academy is the definitive trusted source for peer-to-peer learning in healthcare delivery with a material record of research and policy analysis. Offerings include C-suite executive peer forums, issues-based collaboratives, leadership development programs, research, advisory and media services. The Academy is an accredited CE provider. More information is available at http://www.academynet.com. Healthcare is changing. Healthcare organizations are growing and care continues to expand outside of the four walls of the hospital. This growth provides more capacity to utilize scale to create healthcare companies that are better functioning, smarter organizations. Intra-company logistics - the enterprise-wide movement of physical materials, such as blood and specimens, pharmaceuticals, supplies, equipment, print, mail and more - is the foundation of the healthcare supply chain. Every health system needs transportation for its clinical operations to function. MedSpeed is the market-leading organization that is changing the way the healthcare industry views healthcare logistics by leveraging it to help health systems and other healthcare organizations integrate. MedSpeed treats transportation as a strategic asset that works as a means to achieving greater operational efficiencies, reducing risk, more effectively utilizing scale, eliminating redundancies and centralizing services. http://www.medspeed.com.